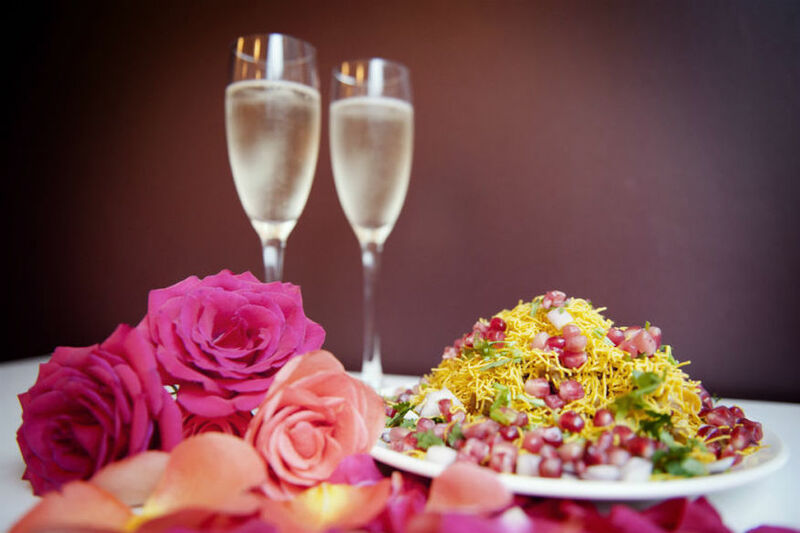 Toast vegetarianism with Gujarati Rasoi's best-selling papdi chaat. Ask anyone in London to name their favourite vegetarian restaurant, and they’ll reel off these names: The Gate (almost always the first), and then in no particular order: Tibits, Manna and Mildreds. Someone will invariably chime in that Vanilla Black is the best posh veggie for special occasions. Then their vegan and raw food-loving friends will enthuse about Wild Food Café, 222 Veggie Vegan and Cafe Forty One at La Suite West. And those in the know will whisper about Itadaki Zen, Europe's first Japanese vegan. But what about the lesser-known places? The local favourites that other Londoners may not know about; ones which haven't yet reached the critics' ears/taste buds? Where are the quirky places, the characterful family-run joints, and the old-school venues where you can indulge in nostalgia-fests of pasta bakes after evenings cooking too many Ottolenghi recipes in a row? 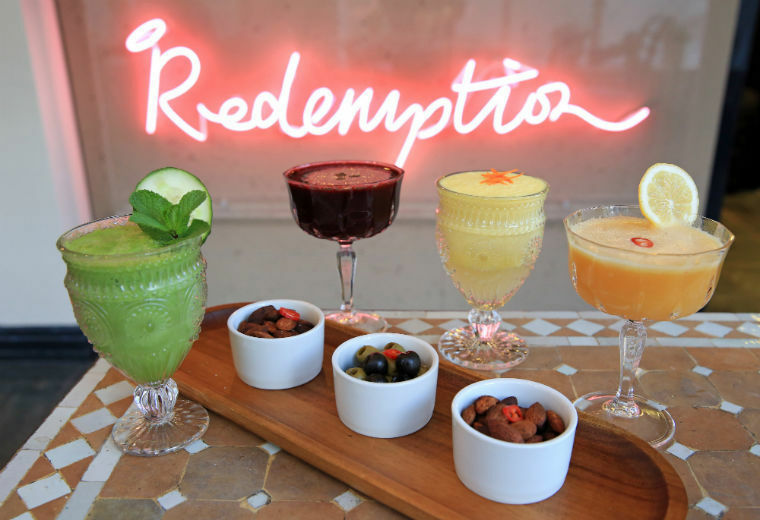 Redemption Restaurant and Bar's non-alcoholic cocktails. Redemption, various: proving that vegan, alcohol-free, sugar-free and wheat-free need not be boring or self-righteous, these stylish restaurants and bars in Notting Hill, Shoreditch and Covent Garden serve attractively presented dishes and non-alcoholic cocktails. Choose from the likes of maki rolls with red and white quinoa and amaranth micro shoots, and heritage beetroot 'barlotto' (barley risotto) with pecan nut 'parmesan'. Farmacy, Notting Hill: Camilla Al-Fayed's Notting Hill vegetarian restaurant serves a large number of vegetarian and vegan breakfast dishes, soups, sandwiches, salads, 'bowl food', hot classics like pizza and curry, healthy meals in jars and puddings. It has an extensive list of hot and cold drinks, too, including cocktails. 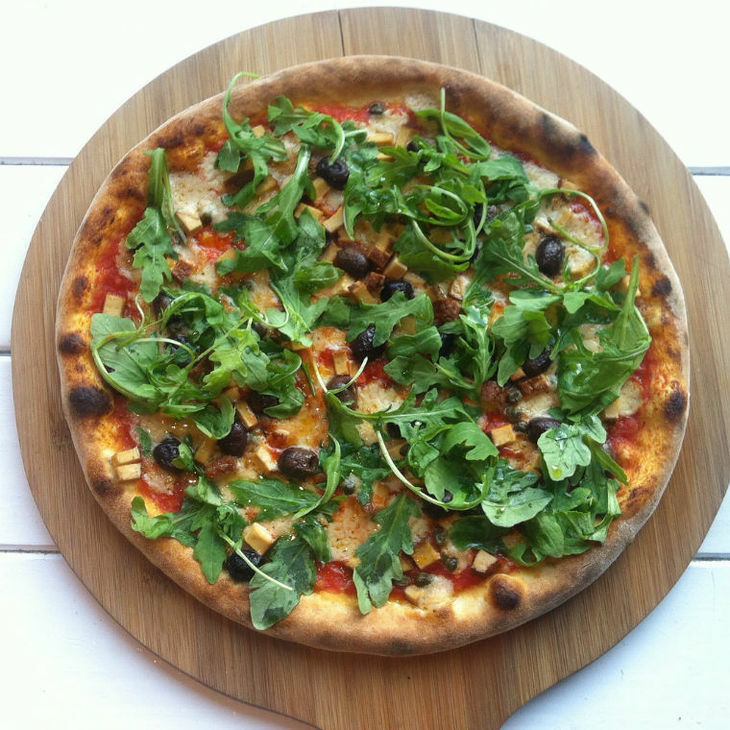 Fed By Water's vegan pizza with tofu, olives, capers and rocket. Fed By Water, Dalston: Located next to Dalston Cross shopping centre aims to promote the nutritional benefits of water, and serves a wide range of Italian pizzas topped with vegetables, vegan cheeses and meat substitutes. Norman's Coach and Horses, Soho: Not to be confused with another Coach and Horses in the area, this legendary Soho institution became London's first vegetarian and vegan pub a few years ago. It's renowned for its 'tofush' and chips (nori seaweed-wrapped battered tofu) – an idea copied by other many veggie restaurants – and piano sing-alongs on Wednesday and Saturday evenings. The venue is still under-the-radar of many vegetarians. Riverside Vegetaria, Kingston: Award-winning it might be, but not many Londoners know about this long-established restaurant, perhaps owing to its out-of-the-way location. Set amid Kingston's beautiful riverside setting, it serves a vast old-school menu of vegetarian and vegan dishes from around the world. From tofu teriyaki to 'Caribbean casserole', you'll find hearty, homely fare here. Go on a sunny day to enjoy the idyllic surroundings. Gujarati Rasoi, Dalston: Owned by mother and son Lalita Patel and Urvesh Parvais, this small Dalston restaurant originated as a market stall, and serves freshly cooked, home-style Gujarati food you won't find elsewhere. The regularly changing menu features the likes of fresh dill pancakes, blackeye bean curry and chai kulfi. Persepolis Café, Peckham: It might be a tiny café inside a shop — Sally Butcher's renowned Persian in Peckham — but Persepolis serves an ambitious menu of meze, indulgent desserts and unique hot and cold drinks. Its vegan knickerbocker glory is a knockout. Andu Café, Dalston: A small Ethiopian vegan café in Dalston, Andu serves a tasting platter of six colourful dishes served with a choice of injera bread or rice. My Village Café, Camden: Offering a vast number of Mediterranean and Middle Eastern dishes — including Kurdish breakfast — this rustic, characterful veggie café serves up vegetarian food with a big heart. Just Fab, roaming: This street food company serve vegetarian Sicilian treats around London. There are soups, pastas, pizzas, burgers and salads on the menu – but try the panelles (chickpea flour fritters), polenta muffins and vegan tiramisu. They formerly traded out of a red, double decker bus in Hackney but are currently looking for a new permanent home. Cookdaily, London Fields: A vegan café under the railway arches in east London? Well, why not? Bright global (mostly Southeast Asian) flavours shine through in fabulous bowl dishes like fruit and veg tossed in tamari-sesame dressing with plantains, cauliflower 'rice' and dehydrated banana. Don't miss the teriyaki bites. The Canary, Bethnal Green: This hair salon/vegetarian café (yes, you read that right) serves a snack-y menu of salads, pastries, cakes, and vegan pizza. 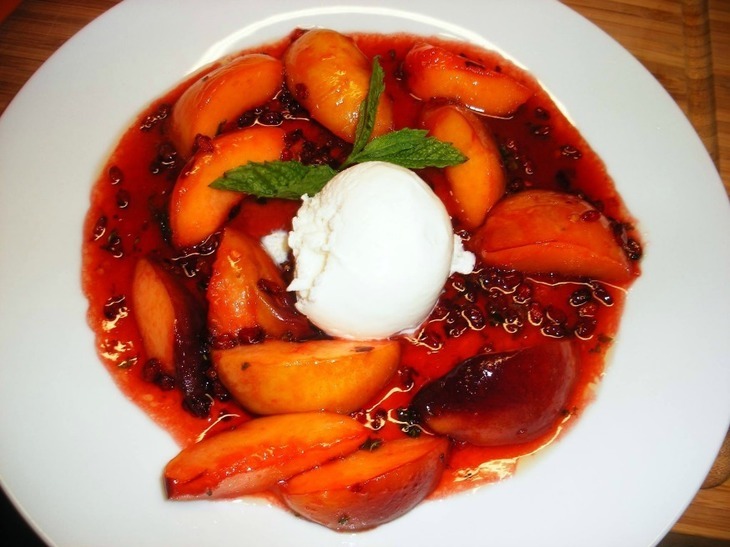 Karamel Restaurant, Wood Green: There's a vegan restaurant inside Wood Green's live music, cabaret, comedy, theatre and arts venue. The daily-changing menu features soups, pastas, curries, stews, pasties, and more. Green Note, Camden: This is primarily a cosy, vibrant live music bar in Camden. It serves vegetarian snacks and small plates from around the world, featuring the likes of tortilla, tarts and tabbouleh. Drink of Fulham, Fulham: This is a beer boutique, not a restaurant — but it serves freshly-made Gujarati vegetarian snacks on Saturdays to nibble alongside its carefully curated tipples. Bühler + Co, Walthamstow: Owned by New Zealand sisters Meg and Rosie Bühler, this beautiful vegetarian cafe in Walthamstow serves imaginative hot dishes with global flavours. There’s a growing counter of sandwiches, toasties, muffins, buns and pastries too. The Waiting Room, Deptford: The Waiting Room is the domain of top-notch coffee (milk substitutes as standard, of course), plus vegan sandwiches, snacks and cakes. The Full Nelson, Deptford: The guys behind Deptford's The Waiting Room (above) branched out, taking their vegan junk food concept and bringing it to The Full Nelson. Here you'll find loaded 'beef' burgers, corn dogs, loaded fries, 'chicken' wings and basically everything you need to to justify spending the rest of the afternoon prone on the sofa, says Londonist's Ruth Hargreaves. Thenga Café, King's Cross: This cool, friendly café specialises in spicy vegetarian flavours and indulgent vegan cakes. Past menus have included homely cauliflower and potato curry with plantain and tomato jollof rice, pecan pie, and cranberry cake. Tide Tables Café and Hollyhock Café, Richmond: Located in a beautiful setting near Richmond bridge, these two vegetarian siblings are ideal for a summer lunch. There's a hearty menu of dishes ranging from Moroccan harissa flatbread, to bean and vegetable chilli on brown rice. Go on a sunny day to make the most of the location. The Hive Wellbeing, Bethnal Green: Bethnal Green's healthy eating mostly-vegetarian restaurant and wine bar is great for breakfast and lunch — but also serves a tapas menu after 5pm, to be eaten with their natural, organic Italian wines. Lunchtime options include rice flatbread with scrambled tofu, roasted squash, goats' cheese and cucumber. Kin, Goodge Street: We've already told you about this small, stylish and buzzy café near Goodge Street. It has a regularly changing choice of retro salads and vegetarian/vegan hot mains cooked — and displayed — very well. Café SoVegan, roaming: Often found popping up and markets around the Hackney area, this vegan comfort food stall serves a good selection of pancakes and toasties; plus straightforward mains like burrito, burger and quiche. Bodega 50, Stoke Newington: Hardly anyone seems to know about this Stoke Newington cafe, and those who do, seem to have found it accidentally. 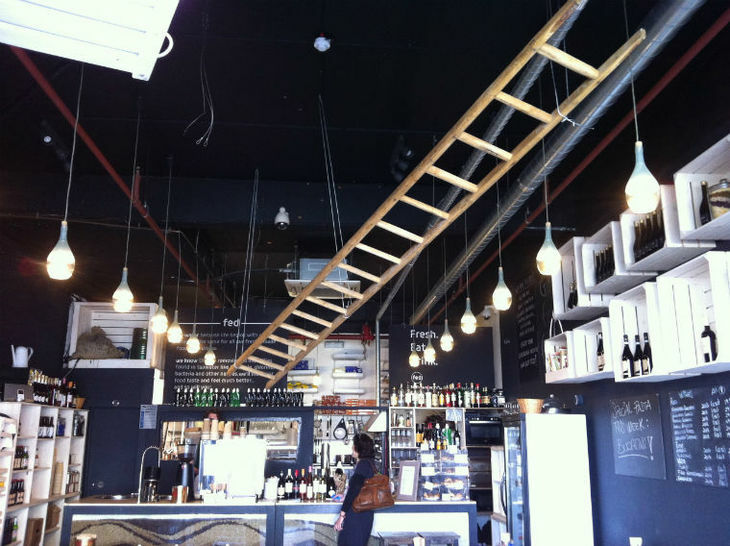 It serves vegetarian and vegan breakfast dishes, toasties, sandwiches, meze and cakes. Carnevale, Old Street: Surprisingly few people know about this small, long-established vegetarian restaurant in the Whitecross Street Market. You'll find Mediterranean dishes like walnut-stuffed artichokes, and breaded aubergines with smoked mozzarella here; plus takeaway dishes in their Saladin street food stall outside. LoveGift Vegan, Hither Green: This vegan café in between Lee and Hither Green serves grains, greens, wraps, salads, raw food platters, burgers, Caribbean classics, desserts and home-made soft drinks. The Larder, various: This series of east London veggie cafés serve a tapas-style menu of baked savouries, omelettes, pizzas and salads. Mary Ward Café, Bloomsbury: Located in the Mary Ward Centre, a popular adult education institute near Russell Square, this vegetarian café serves a changing menu of Italian and global sweet and savoury snacks and hot meals. Whole Meal Café, Streatham: Streatham's long-established vegetarian café serves old-school hearty fare such as Cajun vegetable casserole and French-style cheese and vegetable bake. The Poetry Café, Covent Garden: Poetry Society's serene in-house café in Covent Garden offers a small selection of vegetarian soups, stews, cakes and flapjacks. The Ragged Canteen, Vauxhall: Beaconsfield Gallery has a vegetarian café, which serves a small, simple menu of sandwiches, toasties, hot dishes and cakes. 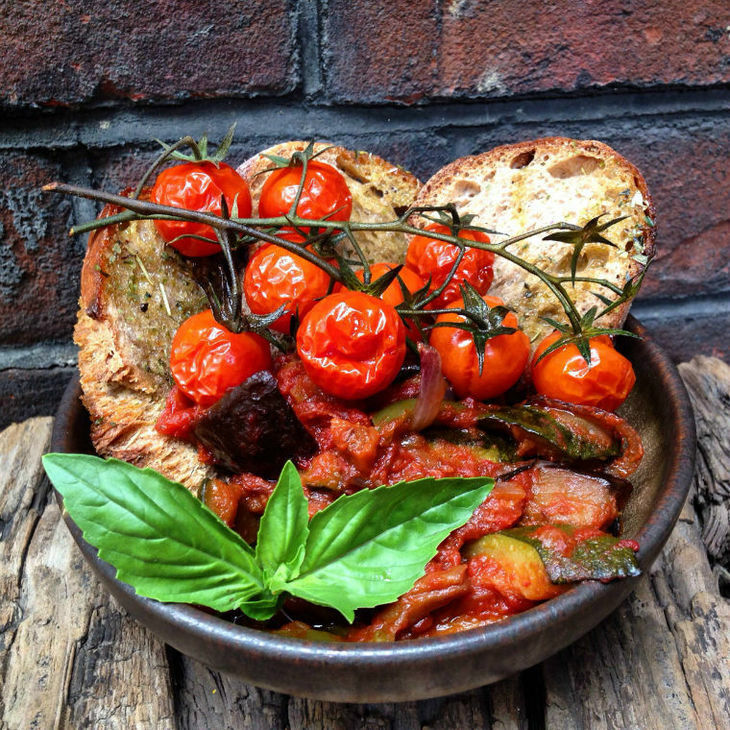 Cafe At Jamyang's ratatouille with toasted sourdough and roasted tomatoes. Café at Jamyang, Elephant and Castle: Owned by the Jamyang Buddhist Centre in Elephant and Castle, this pretty venue is housed inside an old Victorian courthouse, courtyard and walled garden. The vegetarian venue (with vegan-only Mondays) serves delicious dishes such as spelt with purple sprouting broccoli, wild garlic and harissa, and strawberry and rosewater sponge cake. Nectar Café, Camden: Part of the popular Triyoga yoga centre in Camden, this health-conscious café serve vegetarian soups, salads, curries, stews, sushi, cakes and smoothies. Everything is gluten-free, and there are a number of vegan, raw and sugar-free options too. Govinda’s, Soho: Govinda's is a Hare Krishna-run restaurant that claims to serve ‘karma free’ food, says Londonist's Ruth Hargreaves. 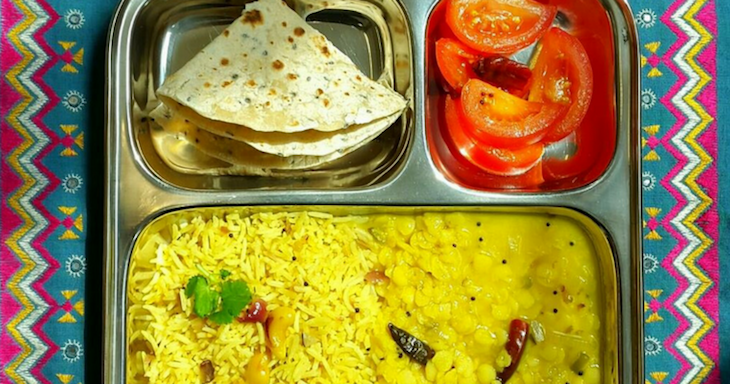 A meal here will keep your conscience clear as this Hare Krishna-run, canteen-style restaurant follows a sattvic diet. This means all the dishes are meat-free, freshly made every day, and even blessed before being served. Gallery Café, Bethnal Green: Owned by St Margaret’s House, an arts and cultural hub for the local Bethnal Green community, this vegan café serves a lovely menu of eclectic dishes. These range from vegan 'pulled pork' wrap, to Ethiopian stew. 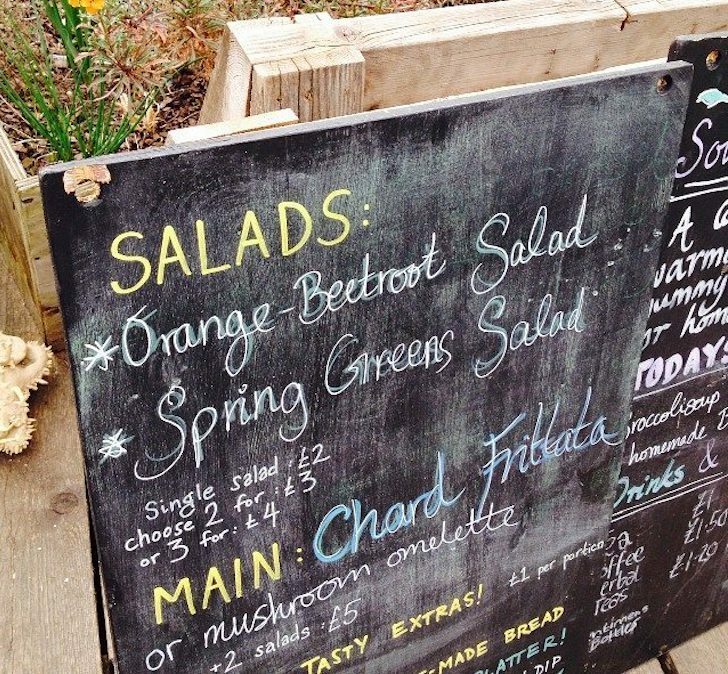 Café Van Gogh, Brixton: Brixton's community enterprise vegan café serves a changing menu of dishes such as chilled pea, mint and fennel soup, penne with foraged wild garlic and walnut pesto, and vegan buckwheat risotto. Skip Garden Kitchen, King's Cross: Part of the unique Skip Garden, a moveable urban edible garden in the middle of the King's Cross development site, this charming vegetarian café serves lavish salads made from ingredients grown in the garden, sourdough sandwiches, snacks, cakes and vegetable juices. It has quite specific opening and serving hours so do check in advance. Hornbeam Café, Walthamstow: Hornbeam community and environment centre houses a budget-friendly vegan café. It serves an appealing menu committed to reducing food waste. Dishes may include roast spiced parsnip mash with Kashmiri-style red bean curry, and leek and turnip quiche with beetroot, sesame and chilli salad. Bonnington Café, Vauxhall: This tiny, co-operatively run cash-only vegetarian restaurant is part of the Bonnington Centre — a community resource for the local Vauxhall residents. Volunteers cook on a rota basis, so the menu changes daily but you can expect hearty dishes like pies, tagine and lasagne. Tanya’s Café, Chelsea: Part of Myhotel Chelsea, this cosy restaurant serves a highly nutritious menu of raw, vegan, organic, ethically sourced dishes and drinks that are free from added sugar, dairy or gluten. The menu is huge — and hugely ambitious — and includes brunch items, salads, snacks, mains, cakes and ‘superfood cocktails’. The Feel Good Café, Chingford: As you can tell by the name, Chingford’s vegetarian café is very much focused on healthy eating. Dishes include the likes of cauliflower, cabbage, chickpea and quinoa soup, and pick-and-mix salads. Jaz and Jul's Chocolate House. 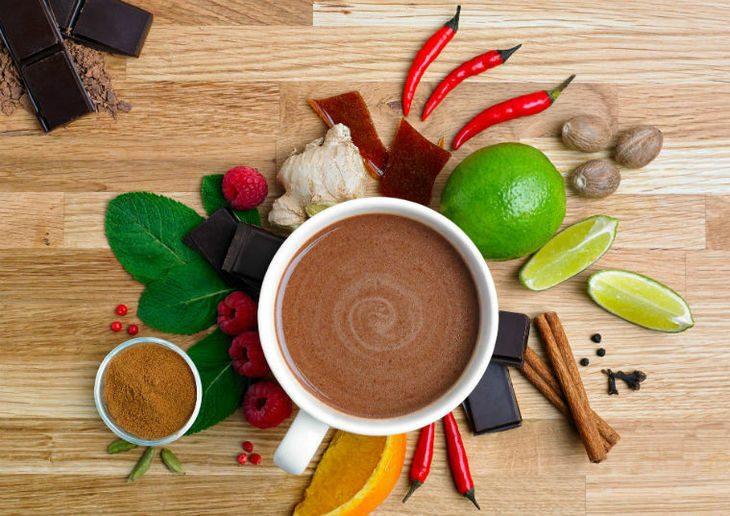 Jaz and Jul’s Chocolate House, Angel: Artisan hot chocolate enthusiasts Jaz and Jul’s Chapel Market café serves not only hot chocs — as you'd expect — but also a choc-centric veggie menu. There's a good selection of toasts with toppings, cakes and desserts; plus savoury mains like black bean chocolate chilli. Waffles and smoothies are available for weekend brunches. Cookies and Scream, Holloway: This family-run vegan bakery sells a wide choice of freshly baked, 'free from' cookies, brownies, pies, doughnuts and shakes. You can sit down to eat the award-winning treats in their Cookie Bar. Yorica, Soho: London’s first vegan and 'free from' ice cream parlour. It has a great selection of rice milk-based ice creams, frozen yoghurts, and shakes with colourful toppings. Ms Cupcake, Brixton: Okay, it's not exactly a well-kept secret, but this much-loved vegan bakery is London's first entirely vegan bakery, is independently owned and still very much deserving of your patronage says Londonist's Ruth Hargreaves. Here, you can buy ‘afters’, including cupcakes, cookies and muffins. Juicebaby, Chelsea: Vegan and raw juice bar that sells a wide selection of smoothies and other drinks, breakfast bowls, salads, sandwiches and sweet snacks. Cyclelab and Juice Bar, Shoreditch: There's a small selection of vegan breakfast pots, soups, snacks and cakes in the juice bar/café of this cycle repair and accessories shop. Raw Press, Chelsea and King's Cross: Although primarily focused on cold-pressed juices, these stylish juice bars serve vegetarian breakfast and lunch dishes such as porridges, salads and lasagne. Pulse Juice Bar, Hammersmith: Handily located right next to Hammersmith tube station, Pulse Juice Bar keeps commuters stocked up on fresh juices, veggie and vegan wraps, toasties and salads. And there are protein shakes and smoothies for those wanting a slightly more substantial slurp, says Londonist's Ruth Hargreaves. 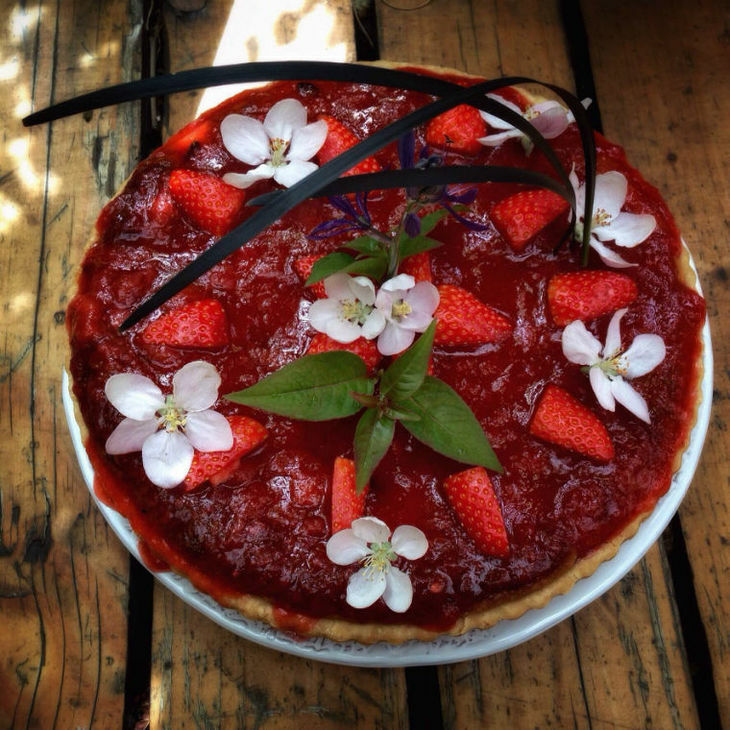 Rhubarb and almond tart with strawberry and rose compote at Café At Jamyang. Do you have a favourite vegetarian or vegan restaurant that others may not have heard of? Tell us in the comments below.